Trying to eat healthy on the go has increased the need for a more quality lunch tote than the paper bag of yesterday. Answer the call for your clients with the Zippered Neoprene Lunch Tote. 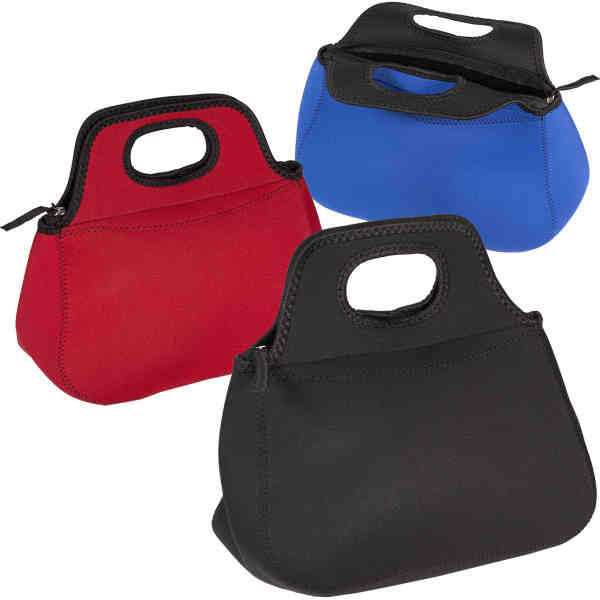 The 4 mm neoprene pouch with a Lycra trim features a padded zipper closure with wide comfort handles. The pouch measures 14 1/2" x 10 1/2" x 6" and can be imprinted using Image Bonding® four color process or transfer. Help your clients spread your name around the lunch table by using this tote as your next promo giveaway! Holds approx. 7 cans of your favorite beverage. Size: 14.5 " x 10.5 " x 6 "
Price Includes: Per 50 piece minimum.